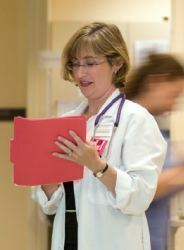 List of malpractice cases in Suffolk Superior court - Massachusetts. Medical malpractice suit against defendants including Alisa Goldberg, MD. See page 1. Medical malpractice suit against defendants including Alisa Goldberg, MD. 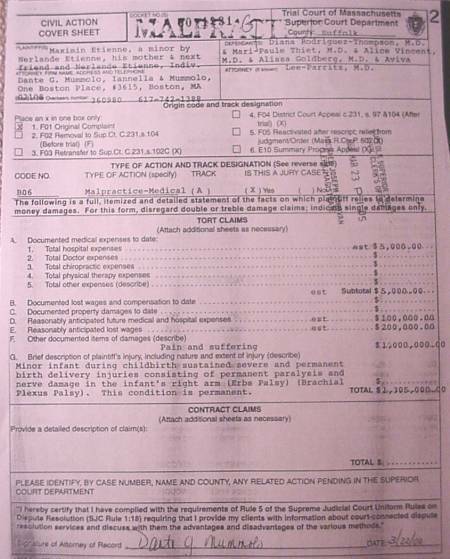 Malpractice claim of $1,300,000. Infant sustained severe birth delivery injuries -- permanent paralysis and nerve damage in infant's right arm. 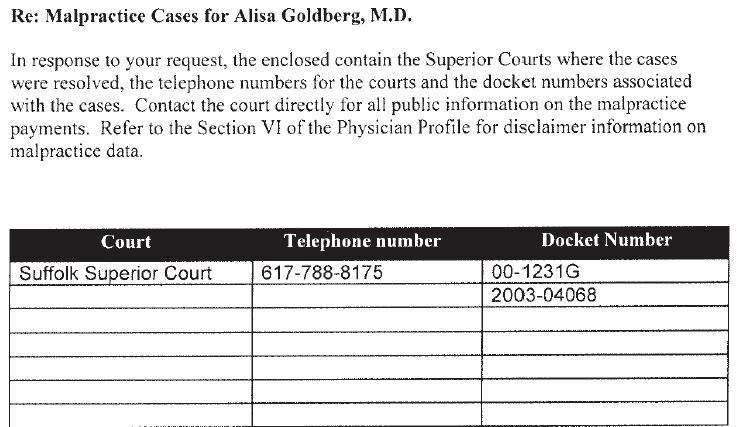 Malpractice lawsuit against Alisa Goldberg, MD, and other defendants. Malpractice lawsuit against Brigham & Women's Hosital, Dr. Alisa Goldberg, and Dr. Julie Miner. Baby Jose Bejarano, Jr. was born hypoxic on March 13, 1997 at Brigham and Young Women's Hospital, Plaintiffs allege that doctors Goldberg and Miner failed to recommend a Cesarean section, and another doctor ordered delivery by forceps. Baby Jose suffered brain swelling & seizures after birth. He suffers from cerebral palsy, is legally blind and unable to speak, is fed through a tube, and has minimal voluntary movement. The court found doctors Alisa Goldberg and Julie Miner negligent in delivering the infant, and awarded $26.5 million to the plaintiff. Oct 15, 2007: Doctors Alisa Goldberg and Julie Miner are found negligent in the 1997 birth of Jose Bejarano, Jr, who suffered severe disabilities. The court awards $26.5 million to the 10-year-old boy and his family. March 2013 -- List of doctors/abortionists at Greater Boston PP, including Alisa B. Goldberg, MD. 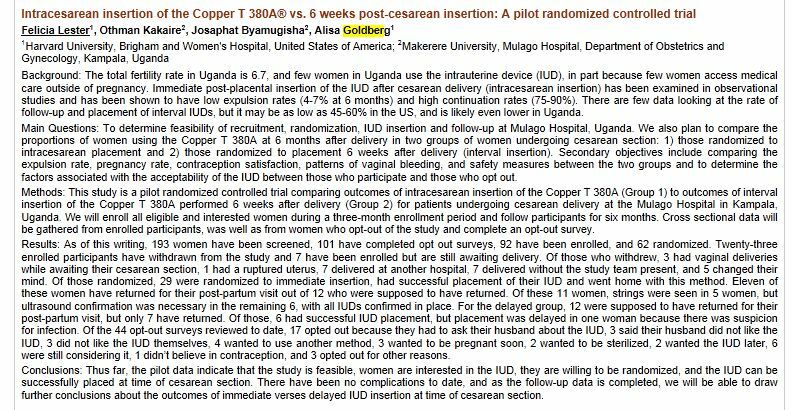 May 2016 -- Alisa Goldberg listing at Brigham & Women's Hospital Family Planning Center (abortion clinic). Alisa Goldberg participates in a second-trimester abortion study with abortionists Andrea Edlow and Laurent Delli-Bovi.